Volunteers are needed for StoryFest: Island Tales, presented by the NSU Alvin Sherman Library. Help to promote a love of reading at this great free event for children and families! 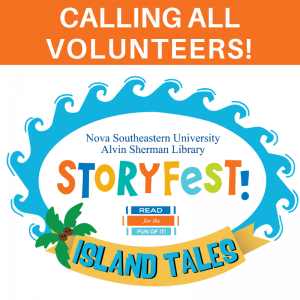 StoryFest: Island Tales will feature theatrical performances, storytelling, costumed characters, face painting, art projects with Young at Art, and much more. Best of all, every child will receive a FREE book! Volunteers can help with greeting and check-in, giving out free books to kids, guiding costumed characters, managing event areas and lines, or handing out water and snacks. Sign up to volunteer at http://lib.nova.edu/sfestvols. For more info, contact Sarah Divine at sf787@nova.edu.